River Thieves is a novel based on the true events of the 1811 and 1819 expeditions into the interior of Newfoundland to ‘gather information’ about the Beothuk. The Beothuk, which means people, were also known as the Red Indians because of their practice of covering themselves and their belongings in red ochre. The Beothuk once occupied the entire coast of Newfoundland, but as more Europeans came over and began to settle, the Beothuk started to withdraw, surrendering more and more of their territory to the new settlers. Raiding and thievery of the Europeans became common, which led to retaliation and bloodshed. Duckworth, the Governor of Newfoundland in 1810, wanted to establish a better relationship with the Red Indians and to help protect them. He sent David Buchan on an expedition to Red Indian Lake in 1811 to try to do just that, but the expedition ended in violence. John Peyton Jr., a settler in the area, went again in 1819 to attempt to recover some stolen goods. This expedition resulted in more violence, but also in the capture of a Beothuk woman, who they named Mary and brought back with them to the coast. 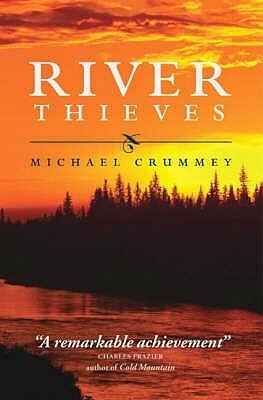 River Thieves is the story of these two expeditions and the imagined lives of the people involved. Although the book is based on true events and the characters were real people, their stories in the book are fictitious. The story of the Beothuks is sad and frustrating, but Crummey is able to bring the conditions on Newfoundland in the early 1800s to life. It was an isolated, harsh, and lonely way of life for early settlers, and I am happy not to be one of them. However, the inhabitants had their own stories and reasons for being there. Crummey weaves their stories and lives into this historical account, that is beautifully written and draws awareness to a a part of Canada’s history that many people may not fully know about. The last known full-blooded Beothuk died of tuberculosis in 1829. She was the niece of the woman who was taken in 1819. This was a very satisfying read, especially so closely on the heels of The Orenda. All of Michael Crummey’s novels are very different, but the good writing remains constant. I recommend all of them. The wild creativity of Galore, I think, is still my favourite, but the River Thieves comes in at a close second because of the compelling historical aspect of it. Does anyone else have any thoughts on any or all three of his books? I know next to nothing about Newfoundland, and this novel seems like a good place (though sad) to start. Thanks for the review! Your welcome! Some other good ones are Random Passage by Bernice Morgan, The Colony of Unrequited Dreams by Wayne Johnston, The Shipping News by Annie Proulx, and February by Lisa Moore. I agree with Carolyn! And thanks for your other recommendations as well. Now I need a recommendation of a book that is set somewhere around where both you and Carolyn live! The red ochre used by the Beothuk was from earth that contained a larger than usual amount of iron oxide, which made the colour more red than yellow or brown. They mixed it with a kind of oil (seal or cod liver oil), then rubbed it on their bodies. I find it interesting too!